Beer on Lees with Black Currant Grapes! Picked this weekend at Fines et fûtés in Buckingham, one éphémère that I’ve been looking for for a while. Usual smooth Unibroue Belgian style, savoury fruity, well-balanced in a slight reddish appearance, another good one from this brewer. Aroma is berries/fruit, malts and distinct yeast. 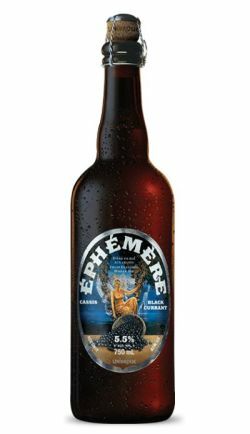 The flavor is complex berries, Unibroue carbonation/effervescence, malts and a mix of spicy and mild/medium tart finish. From the corked, caged 750 ml. bottle that is dated 06-22-2013. A bot older than I expected. The pour is amber with a maroon-reddish huge that takes things over. A big head white head that eventually fades. The aroma emits a full fruity black currant character with the Belgian toasted malt and yeast characters playing second fiddle. Little to no hop character. Might be the age of the bottle. Light to medium body. The taste emphasizes the black currant fruit more than anything else with a mild to moderate bitterness at the end. I could enjoy this on a day when it is 75-80 degrees. Pours a cloudy bright orange topped by a finger of bright white head showing moderate retention and low lacing capacities. Light carbonation comes up to meet the head. The nose is obviously fruity but not overly sweet and even offers a ceratin acidity. I got grapes, cranberries and some green apples. The taste is once again a nice blend of fruity and acidic element paired with a mild sweetness through a medium body and some light sharpness and finishes very dry. Cheers! Draft at Ei8ht Ball. Pours a hazy orange amber color with a medium sized creamy off white head. The aroma and flavor have berries, cherry, grape notes, caramel, with the typical Unibroue yeast character. Decent fruit beer. Taster on tap at Ei8ht Ball. Mildly hazy orange color. Thin ring of white head. Awesome big cherry, strawberry, red grape aroma. So fruity. Yet, so not sugary syrupy sweet, like you’d think such a thing would be. Medium body. Smooth, soft, lighter carbonation. Some apple. Love the aroma on this. Cranberry. Moderate sweet taste, but it has a dry finish. It’s not syrupy, slick, or sugary like you’d expect a fruit-forward beer to be. Definitely a more dry finish. Medium body. Kind of soft, lighter carbonation. More dry finish. Very impressive, stand-out fruit beer. I love the Ephemere series so far, each one has exceeded expectations. I would go out of my way to try each one available. Aroma is of black currant, coriander, a bit of sourness, and a bit of orange. The color is a pinkish orange with the head being light pink. It has quick a lively head. Lacing is not very noticeable. The initial taste is sweet with a dry finish. The is an orange peel bit with the overall taste as well. Shared June 26 at private tasting. Significant pop of cork. Pours raspberry color with big head and lace. Significant carbonation and mouthfeel. Aroma of raspberry, blueberry, rosewater. Flavors of old straw hops, lemon, lime, melons. Overall flavorful and refreshing with minimal malt and hops.